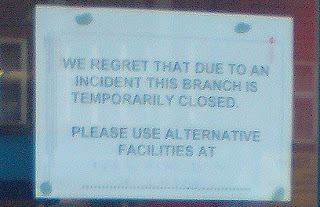 Worcester Park sources tell me that the Abbey bank in Central Road has been the scene of an armed robbery late this morning and is currently closed. Let me know if you have any more info. Also, the old 'Worcester Supermarket' next to the Conservatory Florists is apparently going to be, you guessed it, another bloody charity shop (British Heart Foundation).